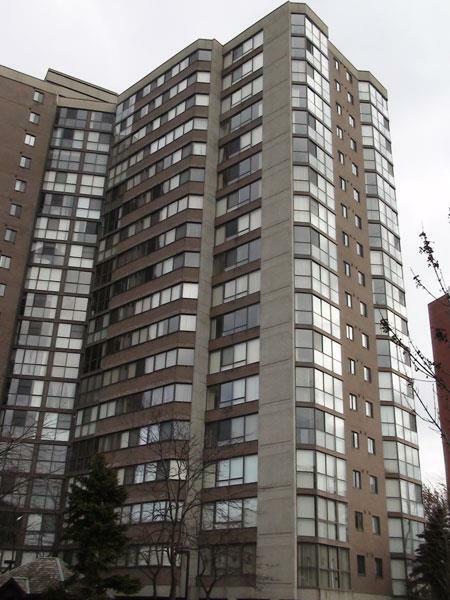 Sherwood Place condominium is located at 4235 Sherwodtowne Blvd. This is low rise condominium with 18 floors and 170 suites. The condominium was completed in 1985. This condominium offers wide selection of elegant and specious suites at affordable price. 1 bedroom suites are up to 1,000 sq.ft, ,2 bedroom suites are up to 1300 sq.ft and huge 3 bedroom 3 washroom suites up to 1,700sf . If you need a lot of space, good location and your budget is low this condominium might be for you. Sherwood Place condominium amenities are: lobby, parking, guests parking, inside swimming pool, exercise room, sauna, party room, guest room and library. There is 24 hr. Security with security gate at entrance of the building.Condo fees include: condo fees include: water, heat, hydro, building insurance, central air condition, parking, common element,cable tv. This elegant condominium is located in walking distance from Mississauga city hall, living arts centre, city library and square 1 shopping center. Minutes from Highway 403.